In the war for truth in Bosnia and Herzegovina, the one fought with other means 23 years after the end of the armed conflict, a new battle is about to begin. On February 7th, Republika Srpska officially appointed the members of two international commissions, one devoted to the suffering of all peoples in the Srebrenica area in 1992-95 and the other on the suffering of the Serbian population of Sarajevo in 1991-95. Both bodies, that will start meeting in March, are headed by an Israeli: Gideon Greif, professor of Jewish history at the University of Texas, will preside over the commission on Srebrenica and Rafael Israeli, professor of Middle Eastern history at the Hebrew University of Jerusalem, will guide the one on Sarajevo. There are fourteen members in total, coming from twelve different countries, including Italy. Journalist Giuseppe Zaccaria, former correspondent of La Stampa and spokesman of Fiat Serbia from Belgrade, will be serving in both commissions. Among other prominent figures, local media report the figure of Adenrele Shinaba, Nigerian police commissioner and anti-terrorist expert. The RS institutions presented the members as "experts, specialists, humanists" that will bring "relevant data and facts" that "all peoples will have to accept, because they will be aimed at truth and reconciliation". The initiative was met with exactly the opposite reaction by civic parties, Bosniak parties, and the associations of the victims of the 1995 genocide, including the Mothers of Srebrenica, that unanimously accused the Serbian-Bosnian authorities of dismissing and trivialising war crimes. Criticisms have also come from the OHR, the High Representative of the international community in the country. However, the harshest and most reasoned criticisms have come, as we shall see, from scholars. All criticisms start from the same point: the facts about the Srebrenica genocide and the war crimes committed in Sarajevo have been ascertained by several verdicts of two separate international courts of justice, the Hague Tribunal for the former Yugoslavia (ICTY) and the International Court of Justice (ICJ) as well as the Bosnian Court for war crimes. In addition to these and the invaluable documentation they collected, other initiatives could have been taken into consideration – first of all RECOM, the coalition of about 2,000 civil society actors who have long proposed the creation of an inter-state commission and listening to all the victims in the post-Yugoslav region. This approach would break down the dichotomy we/them and would spread a principle of mutual recognition of suffering, while respecting differences in the entities of crimes and political responsibilities. This approach could have been very useful, especially in the delicate case of the Serb victims of crimes in Sarajevo, who have sometimes suffered double marginalisation and are entitled to recognition. Instead, the two commissions seem to start from a strictly top-down, pro-government, and partial approach. The invocation of "new elements" and a "holistic approach" to crime research is also perplexing. In 2016, the International Court of Justice rejected the request by leader of the SDA (Muslim nationalists) Bakir Izetbegović to reopen the case on the genocide in Srebrenica. The intent, obviously opposed to that of the Republika Srpska commissions, was to explicitly accuse Serbia of genocide. However, the ICJ challenged the absence of "new evidence" that could substantially change the jurisprudence and literature on the matter. Several analysts are wondering what innovative contribution can be provided by the members of the two commissions, figures largely alien to the scientific community dealing with the post-Yugoslav region. Doubts remain about what could be more holistic than, for example, the articulated report on the facts of Srebrenica by the Dutch Institute for War Documentation in 2002 (a report that was in turn criticised) or solid works by historians like Robert Donia on the events in Sarajevo and the rest of Bosnia and Herzegovina. A letter signed by about 30 international experts in the post-Yugoslav area, published last week and with political scientist Eric Gordy as first signatory, defines the two commissions as "part of a deliberate revision scheme of already established truth", in a "context of instrumental appropriation of history". In reviewing the history of the dozens of commissions for historical truth created in the world over the last 50 years, the letter identifies various factors for their success: a sincere desire for truth, popular legitimacy, a commitment to impartiality and precision, a genuine orientation to reconciliation. "The two commissions are lacking in all these areas" is the clear assessment of the signatory scholars, who rather see this as "a strategy to transform legitimate suffering into an instrument to trivialise the sufferings of others". An equally harsh judgment comes from the IFIMES (Institute for Studies on the Middle East and the Balkans), which in a recent report focuses with concern on the position of the two Israeli professors, Gideon Greif and Raphael Israeli. The report illustrates the worrying growth of anti-Semitism in the European Union, fuelled in turn by growing denial of the Holocaust. According to IFIMES, Greif (who is a specialist in the history of the Holocaust, a collaborator of the Holocaust Memorial Yad Vashem for thirty years, and has also dealt with the Croatian extermination camp of Jasenovac) and Israeli are likely to legitimise not only revisionism in the Balkans, but also a more general wave of cultural and legal denial. To openly challenge the course of international justice would contradict the efforts still in progress – and not always repaid – of the Wiesenthal Centers to try the Nazi criminals still alive. The involvement of Greif and Israeli brings to mind the case of Efraim Zuroff, the director of the Wiesenthal Center in Jerusalem, which in 2015 unleashed much controversy to firmly deny the genocidal nature of the crime in Srebrenica. That voice, at the time, had appeared isolated within the Jewish scientific community. The creation of the commissions on Srebrenica and Sarajevo follows the decision of the parliament of the Republika Srpska, approved last August 14th during the election campaign, which cancelled the "Report on Srebrenica" of 2004. The latter had admitted the crimes of the Serbian-Bosnian army drawing on the documentation used by the ICTY. The 2004 report was widely regarded as one of the most important steps in trying to bring historical truth, recognition, and social reconciliation in Bosnia and Herzegovina. That approach has been completely abandoned in recent years. The government of Republika Srpska, headed by Milorad Dodik, is leading an openly revisionist line on the crimes of the 1990s. There are several reasons: beyond the immediate propaganda effect, the long-term objective is to legitimise the historical continuity of Republika Srpska, justifying not only autonomy, but also a possible future claim of independence. Radovan Karadžić, Ratko Mladić, and all the historical leaders of Republika Srpska are hailed as fathers of the nation, authors of a major operation of legitimate community defense rather than ethnic cleansing. The fact that, in 2016, Dodik named Pale's college student home after Radovan Karadžić, or called Mladić "a hero" in the aftermath of his life sentence in the Hague in 2017, demonstrates how well established this process is. Karadžić and Mladić are currently defendants in the second degree trials of international justice, in charge of the MICT . The final ruling on Karadžić will take place on next March 20th, Mladić's will probably be in 2020. Although they will hardly produce short-term results, the commissions on Srebrenica and Sarajevo will also function as an instrument of pressure in their favour. A mitigation of their sentences would accelerate the process of heroisation. The international factor should not be forgotten in this matter. It is well known that for some time Milorad Dodik has been looking for space in the European ultra-sovereignist zeitgeist. Just a few days ago, current co-president of Bosnia and Herzegovina and SNSD leader met in Vienna some representatives of Austrian FPO, currently in government in Vienna, and Italian Northern League's Dante Cattaneo, future candidate in the European Parliament. The Bosnian media gave wide coverage to the visit, in which the representatives of the three parties reached a cooperation agreement on the migration crisis and the defense of European Christian values. 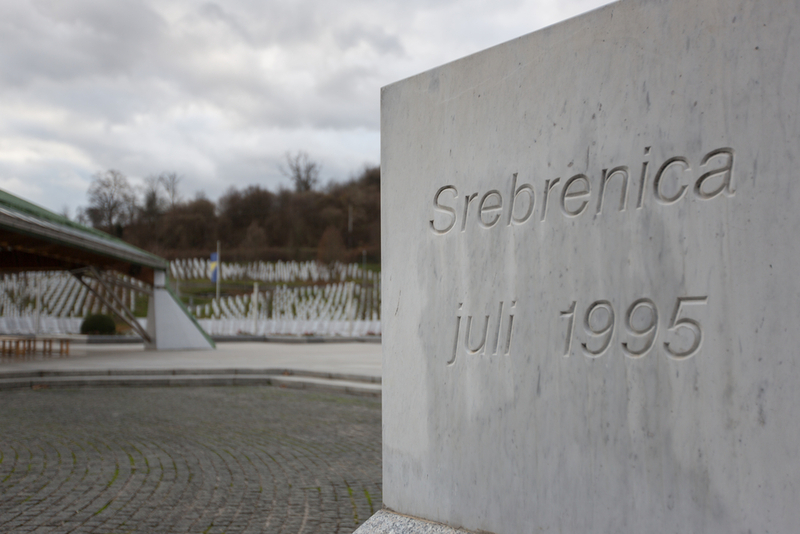 The relativisation of the Srebrenica massacre is part of the macro-narration on the "green backbone", i.e. the alleged Islamist penetration in the Balkans to which Serbian-Orthodox nationalism would, in its own way, put a brake. It is a discourse that has always exercised great fascination over right-wing identity movements, but also over the more transversal cultural universe that calls itself anti-imperialist and anti-liberal, which continuously gains new spaces in Europe. Dodik seems conscious that the revisionist offensive on Srebrenica has symbolic capital also in the international sphere, and it is likely that he will use it to insert himself on the world map of the reactionary wave.